Ba é Dún Bleisce an bunleagan den logainm Doon. Bhain an leagan gearr den ainm i nGaeilge, Dún, stádas dlíthiúil amach i 1975 nuair a rinneadh an chéad Ordú Logainmneacha. Bhí aitheantas oifigiúil bainte amach ag an leagan Gaeilge roimhe sin san fhoilseachán Ainmneacha Gaeilge na mBailte Poist (1969), a thug an Coimisiún Logainmneacha amach. Tugtar meirdreach mar mhíniú ar an bhfocal Gaeilge blesc (ginideach blesce) i seanghluais Ghaeilge. Is é Dún Flesci an sampla is déanaí atá ar an taifead den leagan fada den logainm i nGaeilge. Tá sé seo sna nótaí agus sna gluaiseanna atá curtha le Féilire Óengusso sa lámhscríbhinn Leabhar Breac. Creidtear gur san 11ú haois a cuireadh na nótaí seo le chéile. Mar sin, d’fhéadfadh an dáta, 1410 circa, atá ag tagairt do scríobh na lámhscríbhinne, dallamullóg a chur ar dhuine. Tá an leagan fada ar taifead freisin i gcuairteanna ríoga 1607-8 agus 1615, Douleskie, Donlesk, Doolesky (buntéacs Laidine). D’fhéadfadh sé gur ó liostaí a scríobhadh níos luaithe a tháinig na logainmneacha atá taifeadta sna cuairteanna ríoga seo. Tagann an dara leagan den ainm in ‘Visitation’ na bliana 1615, Doonogonogh, leis an leagan Gaeilge Dún Ó gCuanach. Is é Ó gCuanach (Ó Cuanach inniu) an ginideach de Uí Chuanach, an ceantar ina raibh Dún lonnaithe. I dtuireamh le Séamas Ó Caoindealbhain as iarthar Co. Luimnigh a cumadh sa bhliain 1820, 'sa Dún' an leagan a bhí ag an bhfile. Luaitear Dún Ó gCuanach sa réamhra lámhscríofa a ghabhann leis an dán. Rinneadh taifead ar an leagan gearr den logainm, gan aon eilimint sonrach, mar Duin in annáidí Laidine Dheoise Chaisil in 1511. Tabhair do d’aire freisin an sampla Gaeilge ó circa 1550, ‘i ndún’. Tógadh é seo as cáipéis a leagann amach i mionsonraí tailte dúchasacha roinnt de ghéaga mhuintir Uí Bhriain agus clúdaíonn sé go mion talamh Ó Cuanach, a luadh thuas, san áit ina raibh Dún lonnaithe. Caithfidh sé go raibh an cháipéis bunaithe ar eolas áitiúil. Tá taifead de Dún ina dhiaidh sin mar ainm neamhspleách in An Leabhar Muimhneach. Tá an sampla atá taifeadta i ‘Visitation Book’ Ard-Easpag Chaisil, Séamus de Buitléir, in 1752, Duan, suimiúil freisin mar go mbreathnaíonn sé go bhfuil na logainmneacha atá taifeadta sa chuntas seo comhaimseartha. Tá an leagan Gaeilge ar an taifead mar Dún in Ainmleabhair na Suirbhéireachta Ordanáis do chontaetha Luimnigh agus Thiobraid Árann, 1840. Is é Seán Ó Donnabháin a scríobh Litir na Suirbhéireachta Ordanáis i gContae Luimnigh, a bhain le Paróiste Dhúin, an bhliain chéanna sin. Thosaigh O’Donovan a chuntas mar seo a leanas: ‘it is absolutely certain that this is the Dun Bleisce of the ancient Irish writers’. Ansin, tugann sé fianaise ina leith seo bunaithe ar fhéile éarlaimh an pharóiste, Naomh Fionntan. Tugann sé seo le fios nach raibh Bleisce mar chuid den ainm ag tús an naoú haois déag. Insíonn Irish Names of Places, imleabhar I (1869), le P.W. Joyce, dúinn: ‘the fort [Dún] from which the place received the name, still remains, and was anciently called Dunblesque’. Ós rud é gurbh as Oirthear Luimnigh do Joyce (1827-1914) ó dhúchas agus ó tharla gur fhás sé aníos i gceantar ina labhraítí Gaeilge, léiríonn a ráiteas ‘anciently called Dunblesque’ go raibh an eilimint ar leith a lean Dún imithe as an gcaint roimh a linn siúd. Tabhair faoi deara nár bhain an file Séamas Ó Caoindealbháin úsáid as Dún Bleisce ach oiread. Mar achoimre, is féidir a rá go cinnte, go raibh Dún in úsáid go coitianta ag Gaeilgeoirí ón séú haois déag go dtí gur imigh an Ghaeilge i léig mar theanga dhúchais na ndaoine. Rinneadh athbheochan saorga ar an eilimint sonrach Bleisce ag tús an fichiú haois. Dún Bleisce was the original form of the placename Doon. The short form of the name in Irish, Dún, received legal status in 1975 when the first Placenames order was passed. The Irish form had received official recognition prior to that in publication Ainmneacha Gaeilge na mBailte Poist (1969), by An Coimisiún Logainmneacha. The Irish word blesc (genitive blesce) is explained as meirdreach, i.e. ‘harlot’, in an early Irish glossary. Dún Flesci is the latest recorded example of the longer form of the placename in Irish. This is found in the notes and glossaries appended to Féilire Óengusso in the Leabhar Breac manuscript. These notes are believed to have been compiled in the eleventh century. The date 1410 circa, which refers to the writing of the manuscript, may therefore be misleading. The longer form is also recorded in the Royal Visitations of 1607-8 and 1615, Douleskie, Donlesk, Doolesky (original Latin text). Placenames which are recorded in these visitations may be derived from earlier written lists. The ‘alias’ form of the name in Visitation of 1615, Doonogonogh, corresponds to Irish Dún Ó gCuanach. The specific Ó gCuanach is the genitive of Uí Chuanach, the territory in which Dún was situated. The west Limerick poet Séamas Ó Caoindealbháin referred to the placename as 'sa Dún' in a lament which he composed in 1820; Dún Ó gCuanach is also mentioned in the introduction to this poem in a manuscript. The short form of the placename, without any specific element, was recorded as Duin in the Latin ‘Annates’ of Cashel in 1511. Note also the Irish example dated circa 1550, ‘i ndún’. This is taken from a document which sets out in detail the ancestral lands of various branches of the O’Briens and covers in great detail the aforementioned territory of Uí Chuanach in which Dún was located. The document must have been based on local knowledge. 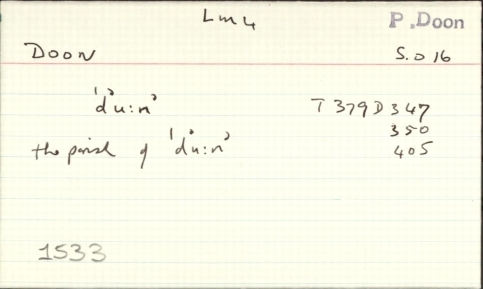 Dún was later recorded as an independent name in An Leabhar Muimhneach. The example recorded in the Visitation Book of Archbishop James Butler of Cashel in 1752, Duan, is also of interest, as the placenames recorded in this Visitation Book seem to be contemporary. The Irish form is recorded as Dún in the Ordnance Survey Namebooks for counties Limerick and Tipperary, 1840. The relevant Ordnance Survey Letter from Co. Limerick, dealing with the Parish of Doon, was written by John O’Donovan in the same year. O’Donovan began his account of Doon as follows: ‘it is absolutely certain that this is the Dun Bleisce of the ancient Irish writers’. He goes on to adduce evidence to this effect based on the patron Saint of the Parish. This points to the fact that Bleisce was no longer an integral part of the name in the early nineteenth century. P.W. Joyce’s Irish Names of Places, vol I (1869) informs us that, ‘the fort [Dún] from which the place received the name, still remains, and was anciently called Dunblesque’. As Joyce (1827-1914) was a native of East Limerick and as he grew up in an Irish-speaking area, his statement, ‘anciently called Dunblesque’, demonstrates that the specific element following Dún had disappeared before his time. Note also that the poet Séamas Ó Caoindealbháin from Co. Limerick referred to An Dún in 1820. In summary, one can safely state that Dún, without further qualification, had been in common usage by Irish speakers from the sixteenth century until Irish disappeared as a vernacular. The specific element Bleisce was artificially revived in the early twentieth century.